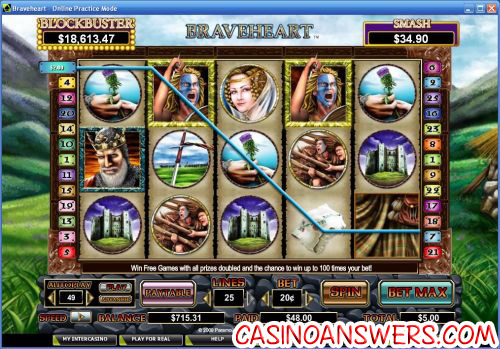 Braveheart Video Slot Guide & Review - Casino Answers! 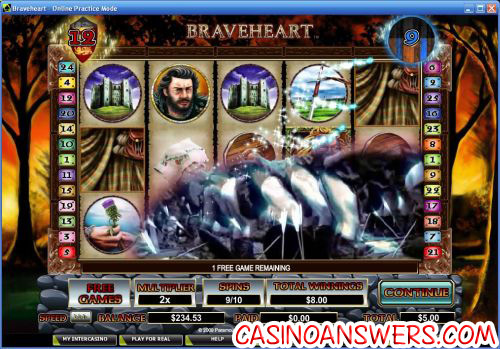 Braveheart is a 5-reel, 25-line Paramount Jackpot video slot from Cryptologic based on the blockbuster Mel Gibson film. It has a five-tier progressive jackpot, a free games special feature with multipliers, a bonus game, scatter wins and wild symbols. You can play Braveheart at InterCasino and Casino Joy. Play at this years #1 online casino for United States - Slots.LV. The historical epic Braveheart tells the story of William Wallace’s revolt against England and Scotland’s war for independence. While many may argue its history accuracy, Braveheart grossed well over $200 million at the box office and won five Academy Awards including Best Picture. Available bets on the Braveheart slot are $0.01, $0.02, $0.03, $0.04, $0.05, $0.10, $0.15, $0.20, $0.25, $0.50, $0.75, $1 and every dollar up to $20. This gives you the freedom to bet $500 per spin on Braveheart, which will make both casual players and high rollers happy. Braveheart also has a Kilt Lift feature. To trigger this feature, the Kilt symbol must appear on reels 2, 3 and 4 at the same time. Three icons will pop up and you can choose two of the three icons. The kilt will be lifted and you will win a prize. Braveheart’s wild substitute feature is Braveheart himself. Braveheart is the top fixed jackpot at 2000X. Prizes will be doubled and Braveheart will deliver a loud war cry when his symbol is part of a winning combination. The Braveheart wild symbol will substitute for all symbols except for the scatter symbol. The scatter symbol is the weapons symbol. When three or more scattered weapons appear on the reels, you will win 10 free games and 2X multiplier. The Braveheart Paramount Jackpot Slot is linked to five progressive jackpots called Hollywood Jackpots. They are, in order: Smash, Epic, Classic, Acclaimed and Blockbuster. Blockbuster lives up to its name, currently sitting at $193,035.86 at the time of this writing. Each of the jackpots is triggered randomly. If you’re lucky enough to trigger one of Braveheart’s progressive jackpots, you will be taken to a screen with a 3X3 grid. You must select from the grid to reveal Bronze, Silver or Gold film reels to raise the level of the jackpot meter. If the meter rises to the next jackpot level, the grid will refresh and you will receive four new selections. From the movie clips, game art, sound effects, special features, everything about the Braveheart video slot is top-notch. Braveheart is a must play video slot for all fans of the excellent movie and highly recommended even if you haven’t seen it. You may even want to after playing the slot machine. But before you do that, head over to InterCasino, take advantage of their 100% up to $225 signup bonus and try the Braveheart slot out for yourself. Can US players play Braveheart for real money? US players cannot play the Braveheart slot for real money. For some of the best US-friendly video slots, try playing at VIP Slots Casino. Where can I find more video slots like Braveheart? If you loved Braveheart, please also read our Forrest Gump Slot Machine Review. For even more slots that are based on movies, please read our list of movie slots. Does Braveheart have a progressive jackpot? Braveheart is linked to the five Hollywood Jackpots – Smash, Epic, Classic, Acclaimed and Blockbuster. Each of these jackpots are won randomly. When you have triggered the Hollywood Jackpots, a screen will come up immediately alerting you. You will then be taken to the jackpot game. What movie themed slot machines are there? What slot machine games like Braveheart are there? Where can I play the Braveheart flash casino game?